Seventeen crackling tracks recorded live in the studio as the band rehearse for their live shows. 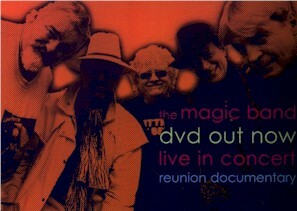 Excellent quality dvd with footage of the Magic Band live at Shepherds Bush Empire in 2003 (80 mins), plus a documentary (50 mins) about their reunion produced by Elaine Shepherd. Dear John and all other band members. I have loved your music since I first heard “Electricity” on John Peel’s show. I have seen Don and the band three times in the 70’s, and apart from the last show where some saxophonist and Don were being self indulgent (Crap) I was mesmerised. I cannot tell you how much it means to me that you have kept the music alive. Many things have changed for me since I saw you last, when I saw you in the 70’s I was David, I am now Elizabeth, but through all my life you have been a constant support. I love you all, and I hope that my health will allow me to come to your Morecambe concert with my brother Steve.